Do you have questions about intellectual property, copyright law, or licensing? Are you an artist wondering how to get your business off to the right start? An attorney wanting to know how to best guide creatives? This workshop is for you! 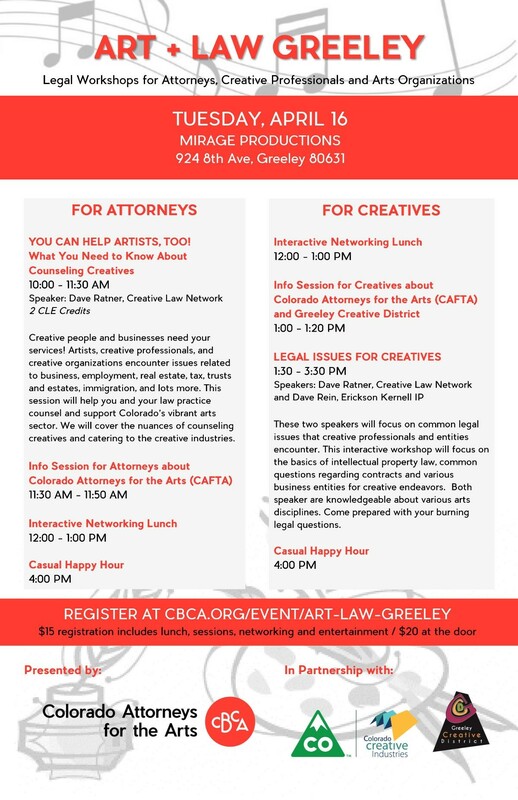 Presented by Colorado Attorneys for the Arts, the Art and Law workshop includes sessions for both attorneys and creatives. Your ticket price includes the sessions, plus lunch, live entertainment, and a chance to network with our creative community. Tickets are on sale now! Register in advance to save $5.